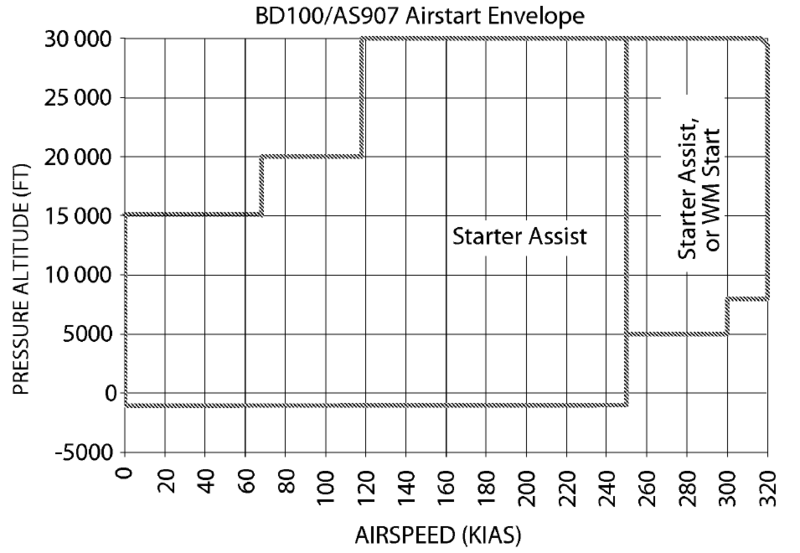 Notice how, although the airstart envelope extends right down to -1kft pressure altitude at speeds not exceeding 250KIAS, it suddenly jumps up to 5kft at speeds of 250-300KIAS, and then up to 8kft at even greater speeds. At first blush, I thought that this had to do with the FAA prohibition on exceeding 250KIAS below 10kft, but, on closer examination, it's clear that this can't be the case, since, if that were the culprit, one would expect the lower boundary of the envelope to jump straight up to 10kft at 250KIAS. The jump in the minimum relight altitude coincides with the minimum speed for a windmill start, indicating that there might be something about the process of windmill-starting an engine that would preclude a low-altitude relight - but, in that case, why doesn't the starter-only-relight envelope extend to higher speeds under the floor of the windmilling envelope? Is this problem unique to the HTF7000, or do other jets have it too? What causes it, anyway? Generally when you see those kinds of limitations it means that the engine or airframe developer had trouble getting successful, repeatable relights outside of the published envelope during development flight testing and you do see it with other engines (the CF-34 that I am familiar with has a similar but much less extreme limitation). In that case it is probably related to density/velocity of the air flow into the burner can during windmilling and I would imagine that there were issues with getting a successful lightoff every time, or excessive peak ITT during the start, or maybe surging problems or something like that. You'd have to talk to a Honeywell person for those details. Not the answer you're looking for? Browse other questions tagged jet-engine engine-failure engine-starting or ask your own question. Why is the combustor volume of a jet engine decided by altitude? Is there an alternative (more robust) operating law/setting for jet-engines? After one engine failed? Is the gas velocity of a jet engine relative to the engine speed or is it absolute? Do some radial engine planes have a two-speed starter motor? How much water is carried for jet engine water injection? How long does it take for a regular size airliner jet engine to be warm?